We love a good Christmas story in my family. It’s a great time of the year to sit down and read some nook together as a family. Our family tries to stick by the same plan every year when it comes to getting into the Christmas spirit!!! We all just cannot wait until Santa comes!!! This is a simple rundown and the best part is that Disney Book Group is partnering with me for a giveaway! First, we start to decorate the house. Maybe we go a little but overboard with decorations in pretty much every room and every nook of the house. That’s ok, it makes us all feel good. We typically do this the day after Thanksgiving. The kids are off, most businesses are closed, and it’s just a slower day on a great weekend to kick things into high gear. Second, we start doing Christmasy things. The best might be going into NYC to see Santa at Macy’s and the big Christmas tree at Rockefeller Center. We seek out all the Christmas shows and markets wherever we can find them. We even try our best to take little weekends for things like the Polar Express! It’s just such a fun, festive, and wholesome time. We love every minute of it!! Third, I get egg nog. Lots and lots of egg nog. With extra cinnamon. Forth, we back cookies, cakes, and heat up apple cider whenever possible. All the great Christmas treats are so welcomed this time of year. Fifth, the kids start really talking up their lists for Santa and how we always sleep in too late (6AM if we are lucky) on Christmas morning. The list seems to grow with each passing day, so there is always some debate, deliberation, etc. Then they bring up Santa…oh boy. Sixth, we tune all of our devices to Christmas music, be it our Alexa, Sonos, or car radio. Everyone has channels that play this amazing music 24/7 and my family and I just can’t get enough!! Finally, we start watching Christmas TV shows, movies, and reading any and all Christmas books/stories we can get out hands on. These things really put us in the mood. We have annual favorites and new surprises that seem to come ever year!! 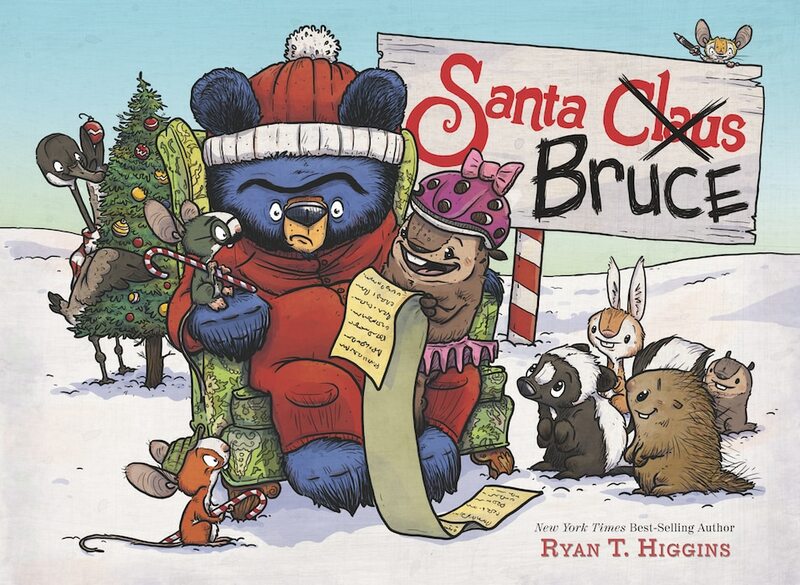 The most recent super cute book we’ve read has to be Santa Bruceby Ryan T. Higgins. Let me tell you a little bit more about it!!! Bruce is a lot of things. He is a bear, a grump, and a pretty decent cook. And he is a mother. One thing Bruce is not? Santa Claus. But that doesn’t stop the whole forest from lining up to give him their Christmas wishes when he becomes the victim of mistaken identity—again. Kids will howl with laughter as award-winning author-illustrator Ryan T. Higgins delivers another hilarious story about this bear who just can’t catch a break. 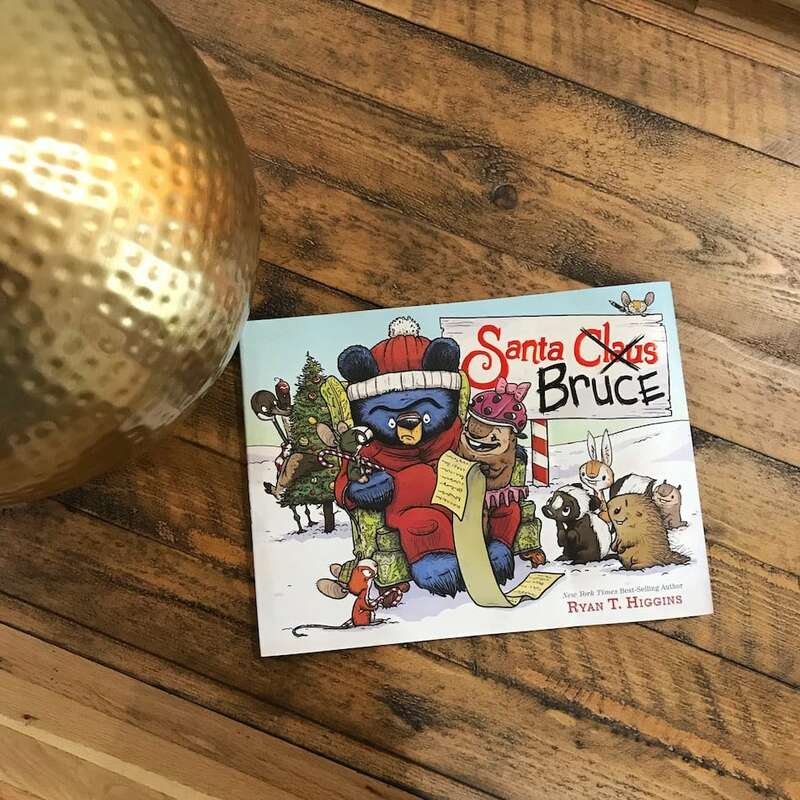 Celebrate with a Santa Bruce Giveaway! 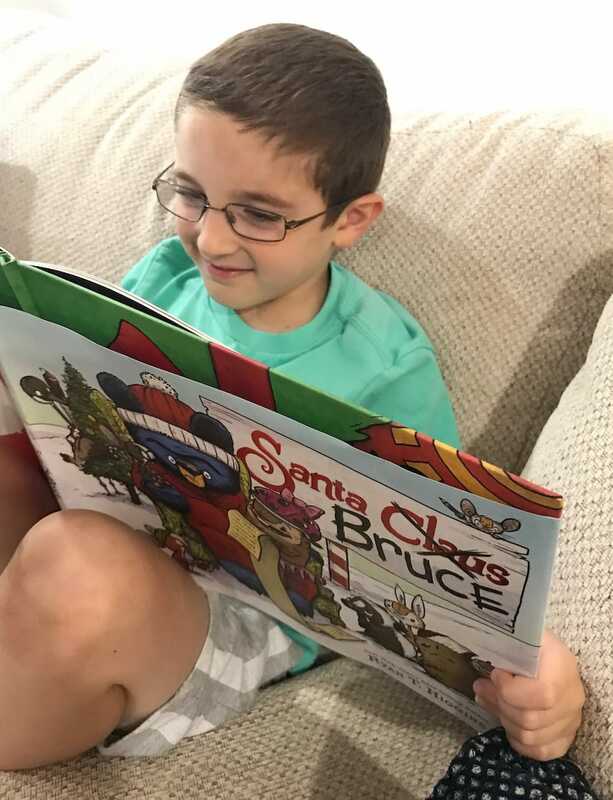 Santa Bruce (Bruce #4) by Ryan T. Higgins is in Stores September 4th, 2018. It’s published by Disney Book Group and recommended for ages 3+. Get online and find out some more about this great book…and the entire Bruce series. You and you kids are sure to love it, too!!! Me going batshit crazy and speed-cleaning the house so I can decorate the hell out of it. My sister hiding stuffed animals in the tree and making them nests. My mom, making an insane amount of cookies. Besides having a Christmas dinner with the family – I’m going to be obvious and say sit back, get snacks (cookies included) and watch a movie. After all, is there any better opportunity to take some free time and enjoy the magic that only Christmas themed movies can provide? My favorite tradition is putting the tree up as a family on my Birthday – December 10th. Also really enjoy my family’s party — the only time of the year that we are all together… my 2 sisters, brother, mom and dad. I like baking, and caroling and gathering with friends. We started a new tradition last year! On Christmas Eve, we set up a Hot Cocoa Bar- complete with homemade hot cocoa and TONS of toppings and snacks, and played board/card games all night! It’s a great way to reconnect with family! “What are some of your favorite Christmas traditions? ?” We don’t do that much nowadays, but growing up it was nice to have big traditional family meals. I love Christmas Eve! We have a fondue, play charades and have so much fun with our family and friends. It is the one night a year that I always look forward to. Thanks for the super giveaway opportunity. We open 1 gift each on Christmas Eve. The kids love that. Decorating the Christmas Tree as a family. We enjoy Christmas dinner and decorating. 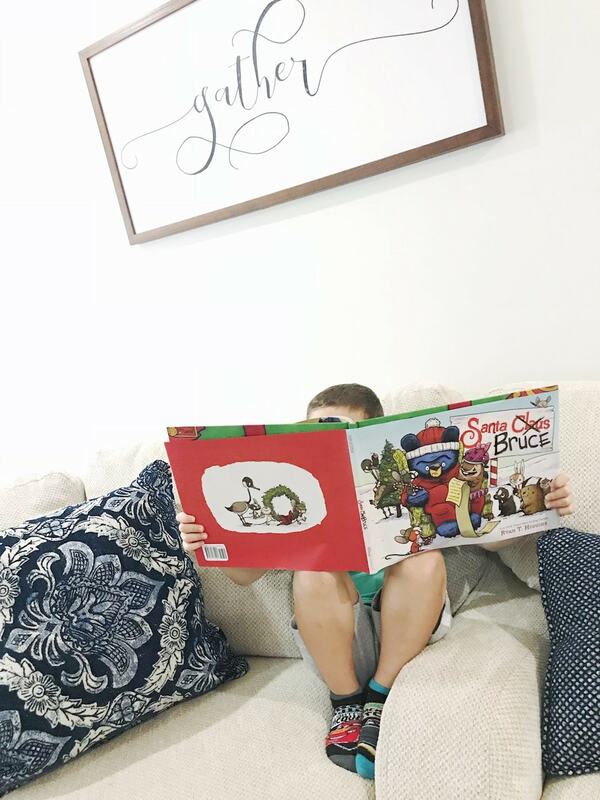 My favorite tradition of ours that we have been doing for about 5 years now…is our Elf On The Shelf brings a box of individually wrapped books on December first…with a note that our little one gets to open 1 book each night for our bedtime story. When the books are gone…its Christmas! We always get some GREAT new books to add to our collection and he has so much fun with it! Storytime is always one of my favorite times of the day! Visiting several groups of family members hours apart from each other, and having others visit us. I like opening one present on Christmas Eve. I enjoy making our family chocolate ball recipe for the holidays. Decorating the tree, and put up Christmas lights. I always enjoy the family party with my parents, sisters and brother — only time of the year we are all together in the same place. One tradition we enjoy is going to look for Christmas lights! We always pick either snowmen or Santas…and see how many we can see on our drive! Great math for the kids! Each year my family opens one present on Christmas Eve, which is usually a pair of pajamas. I also enjoy going to the late night Christmas Eve church service. We always have a Christmas cookie exchange with everyone in our family! We all get together and spend the whole afternoon cooking! We fill everyones pans with cookies for them to take home. We have so much fun! Some of my favorite Christmas traditions is going to pick out our tree and decorating it together and opening one present on Christmas eve. Some of my favorite Christmas traditions are watching Christmas movies, baking cookies, decorating the Christmas Tree the day after Thanksgiving Day. Our traditions are making cookies and decorating the house. What fun! I enjoy making holiday treats! My favorite tradition is baking with my kids. Our Christmas tradition is to gather the family and go look at Christmas lights. The Office Christmas Party is aways a good time. Dinner and drinks with all of the branch offices. spending time with friends and family over a plate or three of food. A few of our family’s Christmas traditions are having an adult gift exchange, making Christmas frosted sugar cookies with the grandkids and everyone in the family participating in the making of Christmas morning breakfast. Stockings in the chimney area and decorating the tree to music.